Seminal punk label SMALL WONDER is being celebrated as part of a season of events celebrating punk in the north-east London Borough of Waltham Forest from September to November. 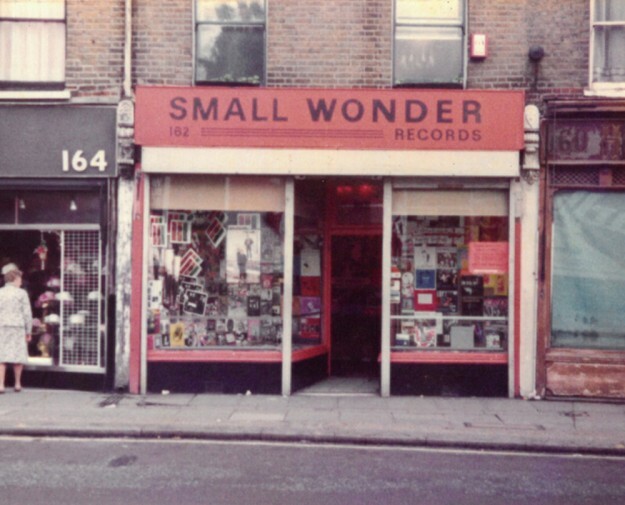 Operating out of Pete Stennett’s record shop of the same name at 162 Hoe Street, Walthamstow, the label kicked off with the release of ‘Mucky Pup’ by Islington band PUNCTURE in October ’77, going on to issue early classics by CRASS, THE CRAVATS, COCKNEY REJECTS, THE CURE, BAUHAUS, THE WALL, PATRIK FITZGERALD, LEYTON BUZZARDS, POISON GIRLS and many more. Central to the programme is an exhibition featuring artefacts, memorabilia and personal recollections of Small Wonder, curated by journalist Neil Meads, which will run from the 5-24 September at Hoe Street Central, Walthamstow before moving to other locations in the borough. There will also be a Small Wonder Revisited gig at Ye Olde Rose & Crown Theatre Pub on 9 September featuring The Cravats and THE PROLES. Get tickets here. There’s also a Small Wonder Remembered discussion at Vestry House Museum, hosted by John Robb and featuring The Shend (The Cravats), Geoff Deane (Leyton Buzzards) and writer David Quantick. The programme also features film screenings, walking tours, a pop-up punk art school and panel discussions -featuring the likes of Glen Matlock, Gina Birch (The Raincoats), Buzzcocks manager and New Hormones Records founder Richard Boon and various punk luminaries – and more gigs throughout the coming months. Presented by Beatroots in conjunction with Waltham Forest, further info can be found on their website and Facebook page. Check out the Leyton Buzzards’ ’19 & Mad’ on YouTube. ‹ THE SETBACKS ARE BACK! You will also be able to hear a 3 hour show of the history of Small Wonder, playing nothing but music released on the legendary label on 11th September 7-10pm UK time / 8pm CET / 2pm EST / 11am PST.